I have used this thing for 2 years now on my heavy mod CR8 printer. is it posible to get a version that fit over a 40mm fan insterd of 30 mm fan? Hands down the best fan mod on the Tarantula. Excellent visibility, excellent airflow. I printed this four times: from zero for a 5015 fan, using itself for a 4020 (which is more than enough), and once again for the 4020+bl-touch. I just have one minor complaint: the bottom screw slots (or upper ones during the print) always come up badly due to the initial excessive overhang. You can even see that in the original images. It would be great if the edge would be chamfered upwards at 45' instead of being rounded in order to have a better finish. I'll try to continue work on it. Does not work for cyclops or chimera. Fang hit the heat block and tip is too low for the low profile nozzle that comes with it. Hi, I was wondering if it is possible to rotate the 5015 blower mount 90 degrees to the left so that the screw holes to mount the fan with are on the left side of the ducting when facing it from the front. Right now the orientation subtracts a far margin of space on the Y axis on some printers; while rotating it to the left will increase Y travel by 30-45mm and only lose perhaps 0-10mm on the X axis. I have tried to rotate it myself, but the bracket needs some reworking to fill in the spaces between the duct and the 5015 bracket and I am unsure how to go about those changes. I have an issue with this shroud and V6 with 3d printed stock fan shroud and 30mm fan. Fang shroud ends not allign with nozzle, they are moved 3-4 mm from the center. Is it suppose to be that way? Would someone kind enought to make a version for the chiron one and use 40x40x10 radial or axial fan? i have zero knowledge in modelling :D thanks! cool thing ! russia love you ! So i installed the the wider fan over my J-head and it just fits perfect, but im getting a thermal runaway when i use it. Any suggestions? Is there any way to get the sn-04 sensor bolts to thread more tightly into the fan? Mine is quite loose and I can't quite get it to stay in position. Hello, i printed the latest version of your fan and installed it on E3D V6 (original) but the nozzle is not centered between the tips on Y axis. It's only ~3mm in..Any idea? I saw that the fang can be lowered and raised. Is that so the I can adjust the height or the bltouch? Or is the bltouch already at the perfect height? Does not fit Tevo Tornado,not even close. Very good design. I tried 4020 version with bltouch and it worked great, thanks! I have two comments for improvement; I would have preferred bltouch position on the left or front since on original tarantula sensor limits x axis range because of the mainboard. Also, I used nuts to move bltouch 2mm downwards. This is a great design but I really don't understand where or how the LED strip is attached. I don't see anywhere to locate them - is there a separate model for the LED holder? Is it just glued underneath the hot-end fan? I was expecting some sort of flat surface to mount it on. Hi haitham. Thanks for sharing this very good design. What about saying in the description on which fan size this duct is meant to be mounted on ? Is there something going wrong with my printing? The result looks different. I just finished editing your fan to fit my 40mm fan and a 6020 fan. But when I'm trying to adjust the height it looks totally different from the gif you posted. Thanks for the awesome design! Hi, I really like this fan fang and been using it for a long time now. I use the bltouch version and recently I bought a 40mm fan for the hotend to silence the printer. Sadly it doesn't fit, I know there are adapters around and It would be possible to remix this and an adapter into one design, but I don't have any experience in designing stuff. Would you be able to add support for a 40mm hotend fan and a bltouch mount? I found one remixed version for the 40mm hotend fan but it does not have the bltouch mount and I don't know how to add it. Does it fit to tevo tornado? edit: now I am sure it will not fit. Please, add clear info in description to which tevo printers it fits. Hi I got it to fit my tornado fine with the correct bracket, the only problem for me was the bltouch placement. im wandering if you could do an stl with the bl touch on left hand side, would be really grateful if you could. Would there be a way to change the radial fan mount to an axial fan mount up top? The reason I ask is that I believe I can get more airflow using it rather than the radial one. Another reason is that most axial fans use a 4 wire setup that allows for different voltages to speed up and slow down the fan and also to monitor fan speed. One other reason is I think it would look better. I have read so many reviews on your fan duct design and all say it has the best area flow to get the best printing results. I would gladly contribute $$ in order for you to do this. I just ordered my first 3D printer and cannot wait to get some mods done to make it even better. I will post pics when it is setup with the new fan mount if you can modify it this way. Thanks, with the desk fan it turned out great! Good afternoon, it serves for an E3d V6?, Is that I buy this hotend for my Tevo Tarantula. Any chance to share STP files @Lion4H ? Hi, I'm delighted with the design! I tried to fix it for my printer, but I did not succeed. I not worked before in a blender. Maybe someone has a ready-made design for this model? Maybe someone is willing to correct the design for me if it's easy? red dots indicate the possible places of fastenings. red crosses are blocks of obstacles. added model, which I did. on the z axis moves the table, enough space on top. А problem with work in the blender. I've looked at a few lessons, but it's not enough. I will try again, if in the near future there is no one willing to help. Can you post a step file of the 5015 regular one? Sweet looking design! Will it work with the auto bed levelling sensor though? Hi, fantastic design as I already stated, I'm just wandering if you could design for two fans. Was thinking if the fan base could be turned around to the side, then add another base to the other side we could mount two fans. I would have a go at doing this my self but I'm quite new to this and I'm finding the design software quite hard to use. It would be fantastic if you could do this. Fantastic duct this best ive used yet. Hats off to you mate. In terms of wiring the fan, do I just clip the old wires and solder the new ones? Further, do I need to adjust anything within the software? First good job, I have a lot of time that I want a fan duct like this for my 3D printer. I don't have a Tevo Tarantula, my 3D printer is the 3D Flsun its similar but the fan is of 40x40 mm. You have a reix of this proyect for a fan of 40x40mm? Love this design and already using it on my first cheap Prusa clone. Recently started building a new Cartesian printer, but I would really like to use some of the fans I have already. Would it by any means be possible to alter the design to fit a 40x20 axial fan and a 6015 radial fan? Would hate to use another fan than yours! I, too, had problems with the arms that hold the fan being a bit fragile. I assume that is what you mean? If so, I actually modified this tonight for thicker arms - thicker by 1mm. I am printing it now. If it prints ok, I would be happy to share that with you if you still need it. Sweet, yea, that is where mine broke on two different prints. Share away! I finally printed another fan housing that mounts to the back. I like it because it is more hidden....but I also had to tap the aluminum bracket that it mounts on, as they were not tapped. I can send the link if you wish to look at it. I do think this fan design is wonderful. But what is the x and y offsets for the bl touch? im having a problem with the LJC18A3 version. how can i set the sensor screw just at the right height for it? im trying to set it to the right height or the right offset for hours with no success. where exactly in the firmware? do you mean the z offset? I have a problem with mounting the BLTouch, isn't the mount too high on the fanduct? If I lower the fanduct then the fang is lower than the nozzle. What to do? also what is the Height offset for the bltouch? Wish I'd read the comments first on this. I would have realised before 2 failed prints, two good prints, and an attempt to re-calibrate my X axis that the issue is that it is designed for a 30mm fan and not the A2 kit "standard" one at 40mm. Thank you, i found the design very good and will print it as soon as my fan come in. You made a great job for the design and the explanation. says hot ends supported is e3d.. may i be stupid as ask this will fit the e3dv6 hot end? Thanks for a great "thing"
hello, would it be possible to have a version 5015 bltouch for volcano on 40mm fan or is there one? I 'm a novice and do not handle the software well enough to do it myself. Zip ties fella's, zip ties!!! That is all you need. Run the Zip Tie around the top side of the fan mount around the front of the heat sink and SHAAA-ZAM !!! Your problem is solved. I have been using mine this way for months and months with no problems. It might move slightly, i mean very slightly if you apply force to it, but it won't move just from the printer's movements. If it does, well you probably won't have that printer very long. I'm having the same problem as Drogge, could you explain what you mean by "more powerful?" how to turn it to print the best? Anyone else have a problem with temp drops? I insulated my block and reran PID tuning to stop this. But is this much air flow on the nozzle going to be a problem? I mean how much of a temp drop is that nozzle getting is what im questioning. When I ran this with PETG using the fan i had a lot of problems with this. While I do like this design I feel the air should be directed away from the nozzle. What file or files would I print for a fang fan + LED bar for a stock Creality CR-10 printer? Ive tried looking but I cant determine which one to print. Sorry if this is obvious. Thank you for sharing the blend file. Hello, I'm a new 3D printer. Just completed assembly of a tevo tarantula and want to print one of these for it. I have only printed a 20mm cube, but that went surprisingly well considering I had just put the thing together and levelled the bed. So will I need to add supports to the model to print this fanduct? point me to another resource if that is more appropriate than asking this question here. Ok that bull fan fang whatever with the 40mm fan was the best potential but the reason its performance was low was because the tips were screwed up and not even remotely pointing in the right place. The tips need to be blowing horizontal so they just nip the tip of the nozzle. On that one they were just cooling the bed off and any part of the printed model that happened to pass underneath. I am currently using a dual fang cooler on my CR10 with a 22cfm 40mm fan. I want to use that fan instead of the radial fan because that radial fan probably only puts out 5cfm and the resistance of the fangs is high. You pretty much need to run it at 100% to get mediocre cooling at best. With my 22 cfm fan I only run it at 40% for most things. I'd like to use it with my e3d conversion and was hoping to find a fan here that would work. I'd love to see this fan with the nozzles slightly offset for a 40mm fan. By offset I mean the left duct pointed back 2 or 3 mm with the right duct pointed the other way by the same amount so the effect at the nozzle would be a small whirlwind/tornado. for your first point (air hit the bed not the nozzle) do you mean that height adjustment (6mm) was not enough for you ? No it has more to do with where the tip is pointed. Keep in mind air leaving the tip will disperse a bit as it pulls in other air. The tips of the horns should not be pointing down any more then can be helped. While you don't want air blowing on the extruder tip you do want it as close as possible to the extruder tip. If a bit of air hits the tip that should be ok as long as it is not the main stream. My comment on the horn arrangement had to do with one that was tested. I haven't had time to look at yours specifically. For the tornado effect I think you need to revisit my comment. The tornado effect effectively causes air to move in a circular pattern around the part thus cooling more then it would otherwise. Besides that fact I stated that the edge of the stream would still hit directly below the extruder on both sides. With my fan I would never need all the air it puts out (22cfm), so some being offset should work pretty good. The poorly performing radial fans might be different. I have 3 or 4 of them and they perform poorly at best with horns. not sure about your experiments, but Radial fans proved to be more than enough, you may need to set it on 80% max too. if the duct tips were horizontal, it will blow all at nozzle, for example when you home Z, you cannot lower the duct below the nozzle, it'll hit the bed, so horizontal tips will only blow at nozzle, that why they has to be tilted down. Yes I am aware of the whole tip elevation thing.I guess I didn't explain well enough. I printed one of yours out and installed it. Pretty cool that it is height adjustable. My previous fang tip designed for the CR10 hot end was made out of ABS and a print gone bad snagged both horns and ripped them off. Loving that adjustability and your horns are flattened to the horizontal plane just like they should be. Now to see if this e3d setup will print without leaving zits all over. Two air streams pointed right at each other are going to have a low flow area where they meet and change direction. A 2 or 3 mm offset should just help create more of a sheer force id think. Just thoughts with no way to really test. Pretty low on my priority list as well since these seem to work pretty well. Never seen a frame mounted fan. I thought most part cooling fans were 40mm fans. Only downside to this fan is the weight but its not too bad and it is working great. Ill have to remember that duct idea if I can find some lightweight Ill use it on my lightweight cor xy I want to build. Not sure why you couldn't control the fan speed. I can control mine just fine. Now my qu-bd Threeup printer the part fan is literally a big 92mm fan blowing air across the bed. lol Still looking for ANY solution for that but being direct extruder drive there is no room. Do you think possible to make the same with 2X50 Blower? Can I Mount it on an 40x40x10 fan? Cannot see how this is mounted. Does anybody know if there is a considerable performance penalty if using the smaller 4020 fan? Should i worry? Works perfectly - that's what I use and no issues at all. I'd stick with it. The only advantage of the 5015 is you can run it slower to make it quieter. From an airflow perspective, 4020 is more than adequate. Hey! Big thanks for providing the blender file, I wanted to make a few adjustments and that part was easy. But I cannot for the life of me figure out how you managed to fuse the port to the fang for stl-export without getting non-uniform errors. I've been using the boolean/union modifier in blender for fusing parts together but as stated, adding boolean/union op to object Right Fang and setting target to object Port results in an unprintable model with non-uniform vertices along the seam of the two objects. Am I missing something here? How did you manage to export those nice solid STL's ? i Know this is made for 2 tpeas of radial fans, but whats the size for the cold end fan? The stock fan on mine is 40mm. Printed the 5015 for BLTouch and my fan won't fit behind the grille at all. I just read on another forum a guy said his hot end fan is 40mm also. I was going to give this Fang a go before moving to the Hurricane that Sniper made. But I don't have any 30mm fans anywhere. Any chance you'll make a version of this for the e3D chimera, which blows on both nozzles? I'm using it now on a dual v6 setup, and it works great. I saw that one, but do you thing that will fit the chimera? NOTE for updating firmware: aside from adjusting the offsets. Make sure you also adjust the PROBE_BED_POSITION depending on the size of your bed. Thank you for making such a great fan duct! Appears to be due to temperature drops being caused by the fan which was not an issue when I was using the LPAFanduct. Any idea how to fix this? is it a firmware issue? You're right... I checked and default fan speed is set to 255. Any idea what's the recommended value to get a good balance with quality and performance? Thanks a bunch! Thanks for the quick responses. Oh, I see what you mean. :D... I'll keep that in mind. Keep up the great work, sir! I wonder if you would mind making a slightly more compact version of this. say for 30mm fan for cooling the cold part of the hot end (will that be enough??) and make the "fangs" HUG the print head more closely reducing the horizontal size of the whole print head assembly. this would let me put more parts on the print bed "closer together" in spacing for sequential printing. What a awesome design. I as well have the issue with the fan being hit by the bracket, but a washer fixed that. The BL touch mount is too high, the nozzle hits the bed, before the magnet of the BL touch activates. I had to put two sets of nuts on each side to lower the BL touch to the appropriate height. The adjustable screws would be nice, but it seems like it sits flush onto of my heat-sink and I cannot adjust it. I love this fan, best design for airflow that I've seen. I am having some clicking against the heatsink fan though which I believe is due to my printer being off slightly on size, hoping sanding down the screw plate a bit fixes it because this fan rocks. First thanks you for this great desing! I read now a lot of comments about bltouch. I printed the version with bltouch and 5015 fan and it looks like there are several different bltoch available. I have the one from Geetech and the mounting is at the bottom borderline where the sensor is working. its quite unsave for me. is it possible to rise the mounting 3 mm up again?? the others can add nuts to lower it down if needed. How did you make it fit with the thermistor and heat element cables in the way? I looked through all the comments but wasn't able to find anything. Is there anyway we can get a version that is still adjustable, but can accommodate a 40mm fan for the heat sink? Maybe even just make an adapter that people can print so you don't have to redesign the whole fang? This would leave the 30mm part adjustable, and allow for the mounting of the 40mm fan. I found a 30mm to 40mm fan shroud for the v6, but the problem is your fang only mounts to a 30mm fang. So the shroud won't work. This is exactly what I'm looking for! A 40mm w/ 5015 adjustable fang blower for the Creality CR-10 using the E3D v6. Would LOVE it someone can design this and post it up as it'll probably be the most popular fang in months to come. What kind of control board do you have? I think most of the boards have the option to use a port for a heatbed configured as a parts cooling fan in marlin. What is the difference between 5015 and 4020 radial fan? I mean, is one better than the other? so this means, I should buy a 5015 and use it with 80% max? Why not 100%? wouldnt I get better results with 100%? Then i'l buy the 5015 for better results! Amazing I was just looking one for the 40x40x20 blower. Nice work! Printed the LCJ 5015 model. Great and seems to be strong ! Only one point, we are loosing about 1.5cm on X axis. The sensor could have been placed behind a horn and the horn moved on Y axis in front of the sensor. Except that, very good design. I'm impatient to receive my radial fan to mount it. It would be awesome if there was a tian aero version as well! I am using the bltouch version. I found I need to move the bltouch down more by using washers because it just barely hits the plate before the nozzle does. Is there a better way around this? If I didnt add the washers, the bltouch never triggers and I get a nozzle crash. how many mm you think it'll be enough ? 3mm? I am actually use 1 hex nut , but if it can be lowered 2mm, itd be perfect. I re read the details, how is height adjustable for bl touch? for the sn-04 i can see how it is. Yea. it just would be nice to have some extra mm for safety. If the bed was tilted, the nozzle will crash before the bltouch can trigger. Hello, I have the standard hot end, SN04 sensor. What are the X & Y offsets? still no love for SN04 offsets? Hi, Lion4H, I am printing this now and will share my X & Y offsets as soon as I get it set up. I also added wedges on the SN04 mount so support will not be needed when printing. Thank you so much for this design. hi lion. i printed the fan duct but i discover that i can not install it on my hot end. in fact i have the first version of x carriage where all holes are farer from the edge of the acrylic. do you have and adapter or spacer? Do you use the 15 mm × 50 mm fan or a different size? Need to know so i dont order the wrong one. Thanks for the answer, now i got it! One final adjustment. that would be really great. i have designed a 30mm fan holder for the e3d v6. it greatly reduces clogs in pla and gives you better retract performance (because of minimal heat creep - it cools lower compared to the regular e3d v6 cooler). but unfortunately the sideffect is that now i cannot use this great cooler, as the "fangs" are now ~6-7mm too low (~4mm below the nozzle, and i had optimal performance when they were ~3mm above). thank you - i just printed it. i can now make the "fangs" go even lower, but i need them to go higher (by about 5mm). if it is at all possible for you to make the slots start higher and then longer - it would really be great and appreciated. i'm sorry to have to ask this of you, i have experience with cad programs but can never get what i want done with blender... i really wish blender could export to a .step file or any other non-mesh format so i could edit it on my own, i hope you don't find my request imposing. thingiverse should really allow posting images in comments - would make life so much easier. so i probably should have done this in my previous post, here is a link to an image of the new version printed and mounted on my hotend cooler. can't you slide or flip the fan mount ? i'll try to explain a little. e3d's original fan holder has a problem when printing high temp materials (nylons, polycarbonate, etc...) at high speeds (100mm/s and above). you will get heat creep, so if that material needs more retracting for a cleaner print - you will definitely end up with a clog. as you can see, the red line marks where the bottom part of the airflow is (approximation, and ofcourse air will move like a cone - but this is just to illustrate). the space between that line and the heatblock itself ( + exposed nozzle) gets very little to no cooling. you can fix that by lowering the cooler on the hotend, but then it doesn't hold so well (and also you will have a problem with the radial fang) or you could use the holder i am working on - it sits a little below where the e3d one sits (~3-4mm instead of 5-6mm if you use the original) and it also has the wind tunnel pointing at a more slanted angle (~15 degrees) towards the bottom - which is the part you want to cool anyways (it does not help to cool the top of the heatsink). my fan holder also provides some screw points for accessories like z probes and holders for cable ties etc - but that is besides the point. i really hope you'd be willing to consider making an adjustment for these types of cases. I'll definitely keep that in mind, and I agree with you that E3D fan mount can be improved. I'm interesting in your design if you have a working prototype or photo. it need to be ABS or something can stand the heat, otherwise it'll get very loose over time. sorry for the late response - i had to take a few short notice business trips. actually in the picture i posted earlier of the mounted fang being too low (for my fan holder) you can see one of the beta versions. it was very hard to focus the phone camera on it but i have marked what you can see is the fan outlet which is below the lowest fin of the v6 heatsink. it is also at ~15 degree angle for better airflow on the throat (which is where most clogs from heatcreep happen). it is not ready for production yet - as i am still improving the design, i will post it on thingiverse when it is done. in the meanwhile, as a believer in open-source i have no problem sharing the full fusion360 files (or any other format that's exportable from fusion360), if you're interested, on github. i understand your concern regarding heat warping, but the prototype you see in the image is printed in pla and has been printing for at least ~50-70hours, with no degradation whatsoever. i actually don't think it would be a problem since there is a constant airflow. but, i will probably be printing the final design in petg to give it a little extra heat resistance. i do plan on mounting a thermistor on it to see what kind of temperatures it has to deal with, and maybe change the design based on the results. i have had to resort to using one of the inferior layer coolers for my testing, because i cannot mount the fang currently, so if there is any chance you'd be willing to make it adjustable for higher sitting i would really love to go back to using the fang. i have tested many layer coolers, and none have given me the results i get with your design. thanks, i have done more than a few air flow simulations and prototypes. this is not the final version - but the air flow is already very well manipulated for much improved results, especially when printing filaments that require more than 230C. i understand it may seem this way, but it is not just flipped upside down - if that was the case, it would indeed protrude ~5-7mm, and it only protrudes ~3mm (as can be seen in this picture https://imagebin.ca/v/3SvYjdmGuDye - the ruler is held straight and flush but it was hard to get a good angle as i only have 2 hands :) ). it is a very minimal (and in my opinion very acceptable) change from the original in terms of placement - but i did have to lower it, because the 30mm fan only pushes a small amount of cfm at a relatively low pressure. in that case changing the airflow direction ~15 degrees over such a small distance is not effective (in my simulations and testing, perhaps there is a better way that those i thought of, i do not claim to know or think of everything - but i did do a lot of testing, simulation and research). therefor a compromise of just under 3mm was made. there is an internal geometry to the heatsink holder as well that helps with directing the airflow better. i hope that explains it a bit better, and that again - you might reconsider? i'm not 100% sure i understood your suggestion - but if you are suggesting just having straight fins at a downwards angle, it is a design that i have tried, and as i mentioned above - there is only a trickle of air flow at the throat and bottom of heatsink, whereas you actually want the bulk of the airflow. it actually causes more turbulences than actually effecting airflow direction (using a 30-50mm blower here could make it work, but that's not an option for me). but, perhaps i misunderstood you and you meant something else? (apologies if i did) if so - perhaps you could make a quick drawing so i understand better? yes, exactly - it's what i already have in the design (as i mentioned before), but if you look in your picture - you can see the problem, the heatsink fins then change the air flow angle back to horizontal. as they are the only air path (they are effectively a wind tunnel/corridor) so you have to have an opening just below them that lets the air travel in the direction of the throat - which was my solution. not sure if i'm managing to explain this correctly - would it help if i marked it on your photo? is there no way you would consider just making the slots a few mm longer? or do you know of a way to export a blender mesh to a solid object? it is double the current, so it should cool faster than the upper part. if I gonna add extra 5 mm below, then I should extand the hotend fan hole to below too, that leads to block the view area for nozzle, which is a big advantage of this design, and only very few people can have benefit from it, so it is on hold for now, I might extended it 1 extra mm though. so, yes - the bottom will receive more air, (though for those angles there will be some backpressure due to turbulences) - but it's not my intention. the main problem is that most clogs occur in the area i marked in the red circle. it is where heat creep occurs and especially because this area is relatively thin and has no big surface area it needs active cooling, which is what my design does. with the regular design - no matter the angle of the fins, as long as the fan mount is flush with the e3d v6 heatsink fins - air will be blocked at the blue line which is the bottom fin. it is one of the reasons for the design of the new titan aero. my design takes care of that and adds a pretty good air flow to that bottom throat - and in my experiments, even printing with pla at 210C you will have better results, better retractions and a cleaner print (especially if you are using the silicone sock). i did try to have it flush and just add a hole/tunnel in different places (like i said - i have tried many designs) aimed at the throat - but performance was very much lacking with the 30mm fan, and the difference my current design makes is well worth it imho. that's the change i am asking for - is it what you understood i meant? because i am not sure i understand how that will block anything - one of the things i LOVE about the fang design is the easy access to the nozzle, which i would not like to loose - but i do not think this affects it, or am i wrong? i'm not even sure the blue part is needed because there seems to be enough "meat" on the bottom part for the extension. is it really that clogging for you? maybe the reason because of other things like some gap's inside? increase it to 50% or more. which one is for titan? Can somebody post a pic as to how exactly your attaching the LEDs? It's hard to tell from the "above view" pics. But where exactly is it mounted and positioned? Is it meant to blow on the heat-block? According to screenshots - yes, but how you deal with temperature dropdowns? For example - i'm printing at 230 degree celcium, but as soon as fan starts working temperature drops to 210 and it's not enough for filament i'm using, how do you deal with such problem? ok, nvm, i'll adjust fangs in blender, should read description fully, sorry. I have a 5015 fan and i loved using this on my Tevo when i got it but i upgraded to a real E3d V6, and it doesnt work because the nozzles go down to far, I am terrible with blender but i see you have the different files, will any of them work with the e3d v6 if so which one? Hey, how is the 4020 compared to the 5015? I have the 5015 ATM and considering replacing it with the 4020. Hi! I just recieved my tarantula 3d printer, and I ordered the auto leveling sensor, if I have a 4020 fan, which model should I print? Hi, nice fanduct. I tried to print it and is already using it. very efficient. many thanks. man! The sn04 version with the extension on the right bumps into the board and I haven't mounted the sensor itself yet so it would have quite a big X axis loss because of that. Any way it can be fixed/moved somewhere else? It's unusable right now. however, It is not possible to add put sensor on the left , it'll get out of bed when you "home x"
you can't put it on the left, it'll go out of bed when you "home x"
Same problem here. But wouldn't it be the same on the left? It's a wonderful design and provides great amount of air on nozzle, however this greatness makes model useless beause it blows so much air to nozzle which leads to fast tempreture drop and causes temperature runaway. Any ideas how to fix it ? Can we have the fan fang and the automatic platform. Sorry for the bad english (I'm french). what you mean by automatic platform? Does it need to be printed with supports? Good day! You could make a version for Volcano sensor BlTouch? I have not yet mastered the modeling, but would love your blowout. hello could you move the bltouch holder to the front? yes i will make it bad for looks. but it save space when testing the bed. no, i set it right in the configuration.h. it is because btl is set to 35mm right after the nozzle. so when nozzle is in the 0.0 position, the bed can leveling is start from 35mm until 210mm. the 10-34mm is never recognize by the bed leveling. cause probe never over this posisition. you should set it like this "#define X_PROBE_OFFSET_FROM_EXTRUDER 39"
Love the design and it printed beautifully. Does anyone know if there is a remix for a E3D V6 Clone? I printed it and mounted it but the end of the fangs extend about 4mm past the tip of the nozzle.looks like it may need to be shortened by about 7mm. I tried sliding the fan shroud to a different position but to no avail. Again thanks for the design. Interesting, I am using the file published by Lion4H on March 14 2017. I printed the 5015 version .stl. When I look at the model In CURA the model height is 87 mm. When I look at the 4020 version the model height is 78 mm could that possibly be a Volcano version in the 5015 model? Or is the difference in height due to the 40 mm fan vs the 50 mm? Thank you so much form your assistance, I figured out my error. My E3D fan shroud was filliped 180 degrees causing the the fang end to be to low. Turned it around and all is good. Thanks again. Hello, any chance of titan aero support? with bltouch if possible. EDIT: also i know im asking alot lol, but possible on the heat block screws not the fan? for those using radial fan, how do you control the speed? Via the pwm fan output on your MKS board? Won't it have a very high pitch noise at any other speed than full 255? i connected mine to PWM outputs on my board and at any value below 100%, it screams a high pitch noise. did anyone a version for the cr-10 stock mount? If not, is it possible to get a dwg file (autocad)? So i can modify it by my own. like the one in the remixes ? I would like a stock version as well. can u modify to use it with dual extruder? Do you have a version to fit a e3d v6 and titan combo? im currently using the latest iteration of it. i think either angling the top part of the tip down more to direct the air would help or have it to where the upper part of the tip is slightly lower than half of the nozzle length or parallel to the nozzle tip. i ordered some hot end insulators hoping they will help. They seem to have a much wider opening for the air. what type of hot end you have? and which fan? did you tightened the nozzle all the way before tightening the "throat" ? did you plug it too high ? I spent the other day polishing the heatbreak on the clone and it's working beautifully! Any chance you could link to your LED strip source? I'm buried in options. Been searching for a while now. I don't see the issue, they are everywhere, search for "led strip" or for aluminum "led aluminum strip"
Yes, they most certainly are everywhere. LED strip comes in a billion different variations. For starters the spacing isn't standard and can vary quite significantly. The wattage of strips certainly isn't standard. Nor is the color temperature or the lumen output per foot. The LED chips themselves come in a dizzying number of variations - and are almost always noted. Which all adds up to rather startling array of differences. If you knew what you'd used, it would have been nice to know. Your pic is showing just about perfect results for this application. But ultimately, you're right - people can just roll the dice on any old $50 roll of LED strip and hope to get similar results. P.S. The duct design is brilliant. Nice work. Thanks. I hadn't even been looking at the hard backed stuff. That was obviously a mistake on my part. Appreciate the pointer. Much more economical way to get short lengths. I still ultimately need to buy a roll for another project (custom enclosure.) But that's not top priority. So buying the short hard strip is a lot better option to get the underside of the fan lit. Secondly, when I use the 50x15 fan, I am suddenly getting whispy thin streamers similar to this - http://support.3dverkstan.se/article/23-a-visual-ultimaker-troubleshooting-guide#hairy-print . I've dropped the fan speed down to 90% and set retraction to 6.5mm (from the 4.5 I've been using) and I still get those. Any suggestions?Thanks. Great... thanks... I will try to find it...!!! What are the chances of making one to fit a stock MK7 or MK9 hot end? Is there a 5020 fan version? I've seen a couple of other comments requesting a version that mounts to a 40mm hot end fan. I would like to add to that list of requests for those of use that are using upgraded 40mm fans blowing on our hot ends. I am not really good with blender and trying to use the same steps you described to modify the length of the fangs doesn't work for the piece that screws to the hot end fan. and hence I said "not optimal, but quick and easy fix"
Any chance of one for the Green SN-04 sensor? As the author has arranged and there is the best option. Just need to enable support and play around with the options. This works with my BLTouch and E3D. Thank you! The one marked with BLTouch. I had to trim my bracket on top of the x-carriage for the fan duct to fit. I use the aluminum modular x-cartridge from Frankhauser. OK, thanks. I use a blower fan currently. Not sure if that is 5015. Will give it a try. what size screws do i use to affix it to the hotend fan, or are they the stock screws? Great design, Thanks in advance!! I love this design - thank you ! Do you recommend PLA or ABS for this ? The 4020 STL is a non manifold object. In S3D I have a half layer skipped. Layer 260, if its 0.2 mm resolution. Its just wierd. Bytheway, Is it allowed to modify for my own printer, right? Propably just a bug. I re-opened it, and its slices like a charm, without that issue. Hi Haitham, I really like your fanduct design and I want to use this on my printer but I also need a version to mount the SN04 inductive probe that I am currently using. I have no knowledge of CAD and much as I would want to modify your design to fit the SN04 probe, it will take me time to learn 3D design and right now what I want to do is print the fan duct and print supports for my Tevo. So if you can just find the time to modify your design to incorporate the SN04 I would very much appreciate your generosity and understanding. Much power to your designs! Hi Haitham, A BIG THANK YOU !!! This means so much to me :-) If you don't mind, I posted a message on the FB Tevo community announcing this redesign to accommodate the SN04. For sure there are a lot of SN04 users that will be printing and using your design. BTW what do you mean by X,Y shift? Is this the distance from hotend tip to the sensor? Thanks again. Please make a 40mm heatsink fan version. Thank you. I am talking about E3D 40mm heatsink fan to this 5015 radial fan fang version. I am not using stock 30mm E3D fan. You say this works for the E3D hotends, does this mean the V6 with titan direct, if not, is this possible? if so..how? i can not visualize this. Hi, can you share this model? Thanks! last message for today (I hope). Do you plan on adding the E3D Aero to the design? Just installed this on my machine and it is great and want to use it on both my printers. and seeing the Aero really lacks layer cooling support at the moment this would be an awesome addition. I'm glad it fit nice on titan, I'd like to see a photo. I slice it on many slicer, didn't get that missing layer, maybe something related to S3D slicing settings? the tube is one piece, and the other tube is just a mirror, they should both have the exact same slicing result. I think you should try and find proper method to import blender file from your side. I didn't get the part of "lacking layer cooling support"... more details ? I'll try slicing it with Cura or Slic3r and let you know. also, what I meant was, because the E3D Aero is so new, there are not many (or any at the moment) layer cooling fans that have been designed for it and was wondering if your design could be easily adapted to the new setup, unfortunately they decided to rotate the fan 45 degrees. Fusion 360 will work with OBJ files. I'll get some pictures for you soon, I had to ziptie my fan duct on because my E3D cooling fan duct is loose and the added weight made it unstable, other than that, it works amazing. Also, would you be willing to provide a file that would work in Fusion 360, i'd like to try and merge it with this thing http://www.thingiverse.com/thing:222873/#files so that its all one part. OK i've printed this and it fits up nice but for some reason when i slice this in S3D i get a missing layer on the left duct causing a weak point that breaks quite cleanly on that one side. I thought it was just a failed print the first time but the second one did the same thing and when i reviewed it layer by layer, there is one missing. any ideas of what I could be doing to cause this? 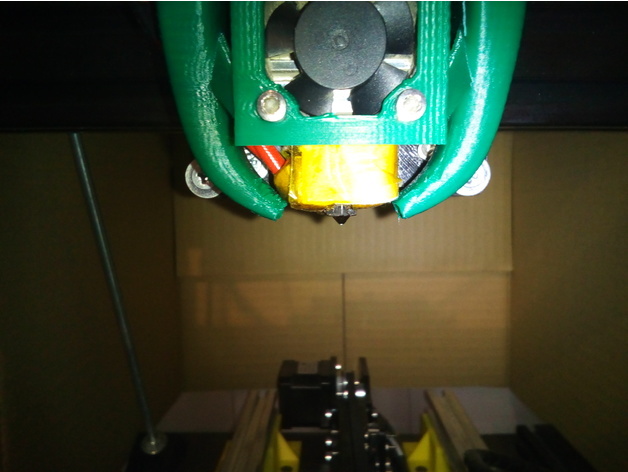 I'm currently working on a D-bot and the setup is installed sideways, thank you for that image though, I did not realize it attached to the 30mm cooling fan of the E3D. Thank you for that. Hi, LionH4. Thanx for your great job! I used your source file and customized the fan for E3D V6 Volcano. Is that for Titan, too? If so, want to share? This looks great! What would be the easiest way to make it work with a 12mm sensor rather than an 18mm one? First off this is an awesome design and solves a lot of the problems I've had with looking for a good cooling solution. However I was wondering if you might be able to edit the fangs to be a bit wider to fit the e3d chimera dual extruder hotend, if it isn't too much work. Thanks in advance. or just shattering the air in all directions like some "surrounding" designs. Thanks for your reply. Was very busy so hadn't thought of the aerodynamics yet, indeed this wouldn't work very well. I do still love the design though. Maybe there is a way to use this design for its looks in a different setup, but that will be a project for me for another day perhaps. I'm trying to push 3d printing forward, to make it easier with less problems. as some tests and charts online proved that radial fan is better for layers, I made this design, to promote the radial fans, make it easier to adopt. I'm no 3d expert, but blender is very easy. 40mm will make the whole design bigger, I might look at it after finishing the BLTouch if I still have time. It's the "calm the fk down" fan! Lol just kidding this is awesome!!! Any chance you could modify the design to take a 40mm fan on the top, instead of a radial fan? If so, it would be perfect for all four of my printers! I got a 75X75X30mm radial fan... any idea on how to connect it or is it just easier to buy a 4020? I'm just concerned that the 4020 doesn't blow enough air.. could just give a link to your radial fan please? 7530 looks very big, isn't it very noisy? Its actually pretty quiet but I'll take your word, i will find a 4020 then :) thanks for your response! 3dNoob question, but what size radial fan is it designed for? Perfect, thanks! Have a tarantula coming to my doorstep soon, this'll be one of my first additions once I get it up and running. it would be awesome if you can export it to step or iges from blender! I'm no 3d designer, it is just that blender is easy to learn. Say thanks by giving Lion4H a tip and help them continue to share amazing Things with the Thingiverse community. Radial Fan Fang by Lion4H is licensed under the Creative Commons - Attribution - Share Alike license. Say thanks and help Lion4H continue to share amazing Things with the Thingiverse community. You'll need a PayPal account to tip Lion4H. Click the button below and you will be redirected to PayPal. Once the payment is complete, you'll be brought back to Thingiverse.